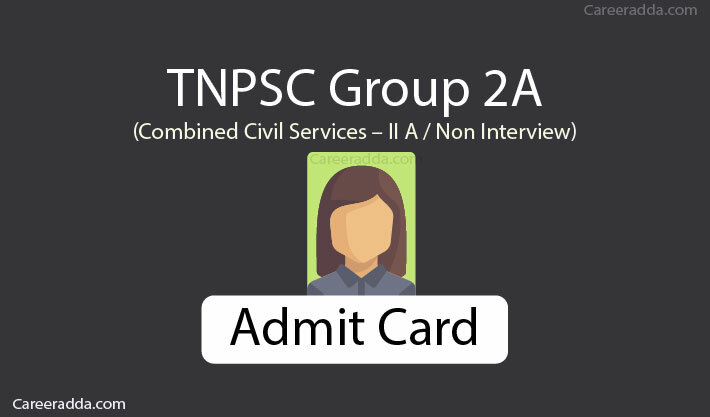 Download TNPSC Group 2A Admit Card 2019 : TNPSC Group 2A hall ticket for the written test will be released on the official website by the Tamil Nadu Public Service Commission. If you have applied for TNPSC Group 2A recruitment, you should have your login ID and application number and your Date of Birth to log in and download the hall ticket for the written examination. Only, those candidates, whose application submission was successful before the last date for applying can download the TNPSC Group 2A Hall Ticket. TNPSC Group 2A recruitment written test will be conducted after releasing the hall ticket around a week before the date of the written test. Candidates who have registered and applied on TNPSC website for the TNPSC Group 2A recruitment, will be notified by the commission about the availability of hall ticket to your registered mobile phone number via SMS and Email. However, just in case, there was a delay in the delivery of the SMS or Email, you might miss the exam. Better visit the website of the commission around a week before the written test to download it. How To Download Hall Tickets? If the details are correct, you can download the hall ticket. Make sure to print the hall ticket and also do remember that you should carry it to the test centre. If you find the hall ticket has some errors, you can talk to the help desk at 8754000961 for further guidance. Otherwise, you can also mail to technicalhelp@tnpscexams.in. You will space to sign in the hall ticket by the candidate. Do not sign on the space as soon as you download the hall ticket. You will have to sign it before the invigilator at the test centre. You will have to download the hall ticket only from the official website of TNPSC and you will not get it to your address. You will have to carefully go through the instructions given in the hall ticket to be followed at the test centre and should strictly abide by the instructions. You should reach the test centre 30 minutes before the test commencement and you should be dressed decently. Remember that you should not reach the test centre without the hall ticket that you downloaded. You will not be permitted inside the test centre 30 minutes after the commencement of the test. In case, you have applied for more than once and got more than a single hall ticket, you should return one of them if they have different registration numbers. When returning it to the commission, you should specify the clear reason for returning. You will have to attend the written test only the test centre allocated to you as specified in the hall ticket. TNPSC will not entertain any change of venue. If you take up the test in any other centre, your answer sheet will not be evaluated by the commission. At the test centre, you will have to show your hall ticket on demand for verification either by the chief invigilator or by the inspection authorities or by the invigilator. You will have to carry a black or a blue pen and the hall ticket only to the test centre. Remember that other materials will not be permitted inside the test centre. In case, it is found that you have any other materials like notes, pencils, books and other electronic gadgets, your application might be rejected or you might even be debarred for a period. The decision of the commission in this respect will be final. If you do not carry the hall ticket to the test centre, your answer sheet might become invalid or there will be a reduction of two marks and this decision will be made by the commission on the basis of your merit. Remember that you should sit only in the seat allotted to you based on your registration number. Remember to follow the instructions given by the invigilator at the test centre to fill up your details in the answer sheet. Before you start writing anything in the answer sheet, make sure that the sheet is properly printed and there is no damage of any sort to the answer sheet. In case, you find that there are some defects in the sheet, handover it to the invigilator and get a different answer sheet.